Looking for a tasty new ice cream without any cream or eggs? Something which would please not only vegans and people with allergies, but, like, everyone? Yes, I know it sounds too good to be true but there is nothing second-rate about Chocolate/Oatmeal ball ice cream! 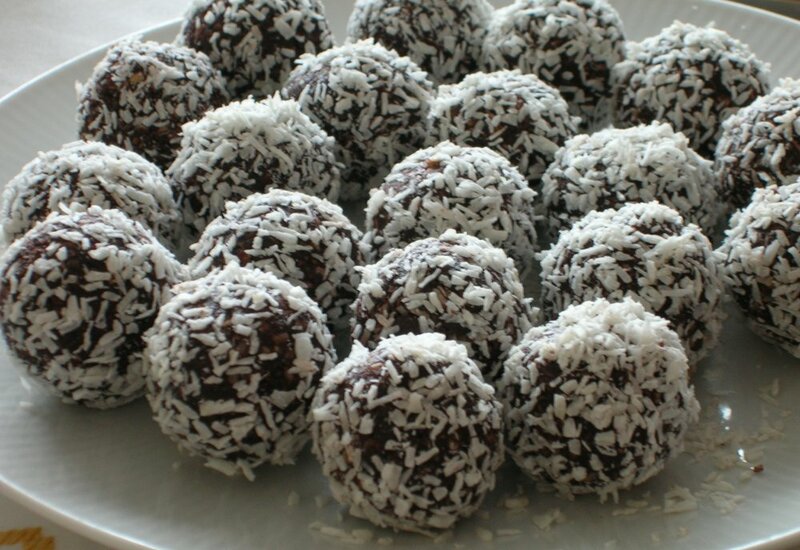 This recipe is based on The Chocolate ball, also known as The Oatmeal ball: a truly iconic Swedish confectionery (while aficionados might argue that the two types do differ a little with regard to whether their respective flavour is tilted towards chocolate or oat, they still remain as close as siblings). Part of the generally beloved sweet balls’ lasting appeal is the no-bake ease with which they are made: it’s literally child’s play … which means that hordes of Swedish children have taken their first steps towards cooking while mixing together the required oat, butter and sugar, forming the balls and rolling them in shredded coconut or nib sugar. We will remain true to the spirit of the classic recipe. And since the overall flavour we are after is sweet oat, we’ll be using oat milk instead of dairy! Oatmilk is one of the classic “plant milks”/”dairy-replacers” (along with soy milk, almond milk, rice milk and coconut milk), and it is quite easy to make it yourself (since it basically consists of oat + water). Otherwise, you can do as I did and pick up some at any close-by, well-sorted food shop/bio-food shop selling it! So, a good choice for those who want to avoid dairy! But – I would like to stress that this is NOT any condescending “In case you can’t eat real ice cream”-recipe! 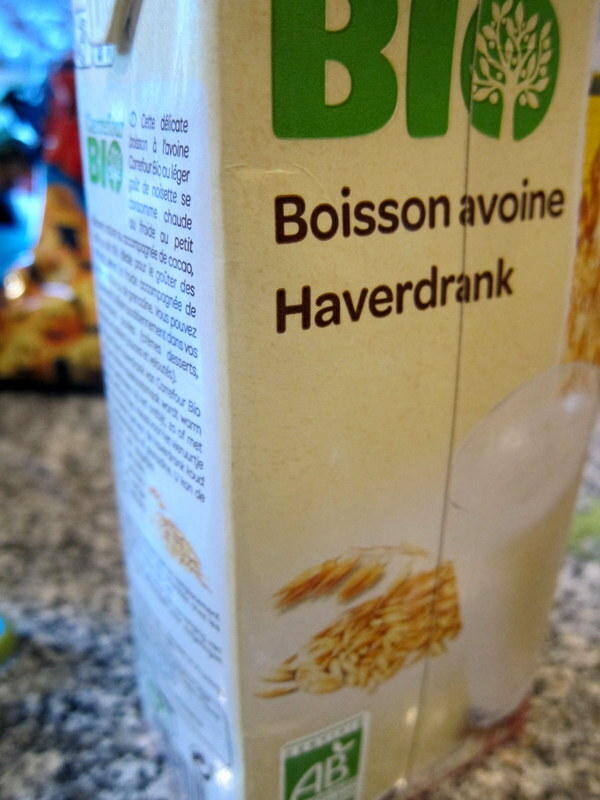 Here, the oatmilk is used not as a substitute for dairy, but because it helps to secure the desired oat-flavour. And the ice cream is as delicious as the “original balls”: any ice cream lover should try it! Oatmilk only takes us so far, however. In order to re-create the allure of the tasty balls which inspires the recipe, we will not only add sugar but also some cocoa powder of good quality. Whisk well! Those who want to ensure that the result becomes even more pleasing to adults could add a teaspoon or so of instant coffee powder. Oatmilk contains little solids, and virtually no fat. The ice cream would end up terribly icy unless we took some precautions. Staying true to the “natural beauty” of the rest of the recipe, I decided to turn to corn starch for stabilisation. Corn starch – a classic ice cream stabiliser – will ensure that the base thickens even without eggs or dairy fats, giving the final ice cream a working consistency. Make sure to dilute the corn starch in a little of the (cold) oatmilk before adding it: this to avoid any lumps. Set aside and heat the main mix of oatmilk, sugar and cocoa (add the coffee later! See below!) to an almost-boil. Then, add the corn starch/oatmilk-mix and whisk well. 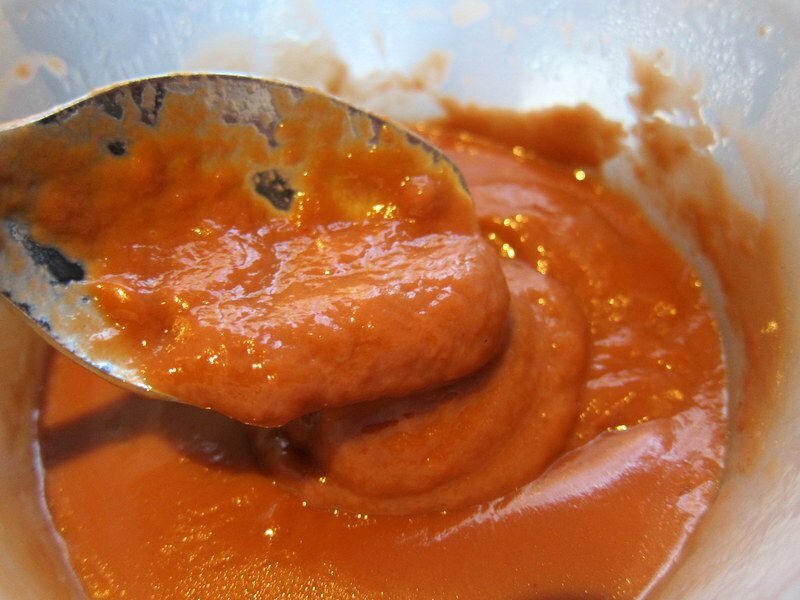 Avoid lumps: always whisk out the corn starch in some cold liquid before using! Now, in order to emulate the classic recipe, I decided to add a tablespoon of butter. Butter is definitely the thing that keeps the original balls together, and a little extra fat will certainly not harm the consistency of the ice cream. If you do not like the idea of butter in this otherwise quite fat-free ice cream, however – just add about one extra tablespoon of corn starch (for added consistency) instead! Once the ice cream base has been cooking for about five minutes at a temperature of about 80°C/176° F, the thickening properties of the starch should be properly “activated”. Take off from the heat. 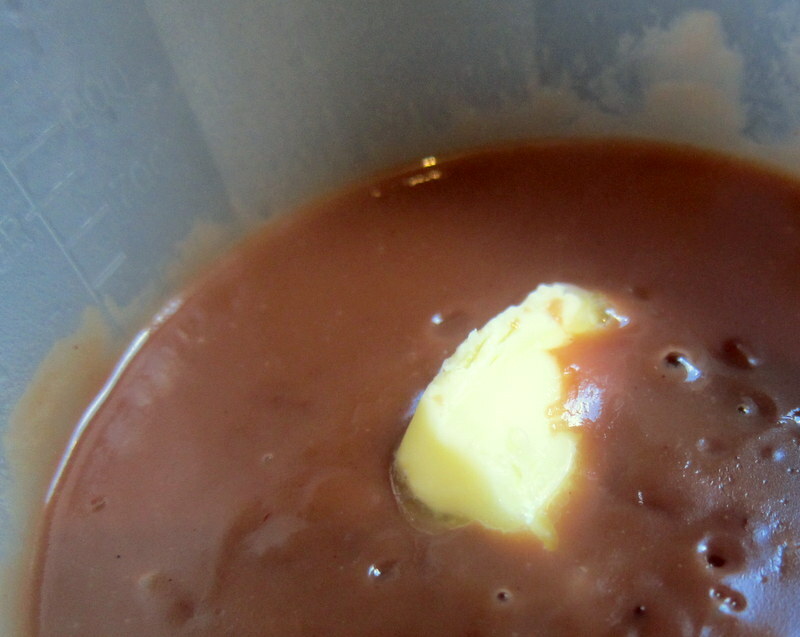 Add the instant coffee powder (if using), whisk and let the base cool down as quickly as possible. 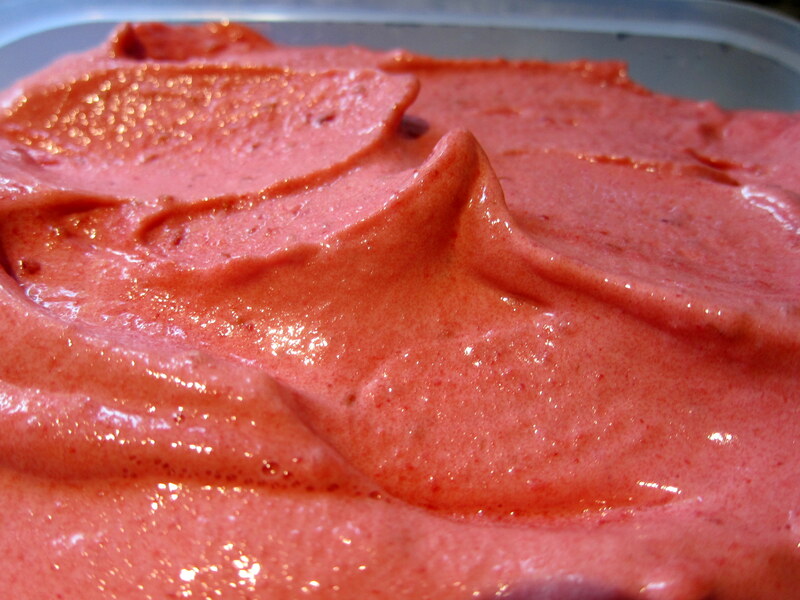 Once cooled down, preferably let it chill in the fridge before churning. 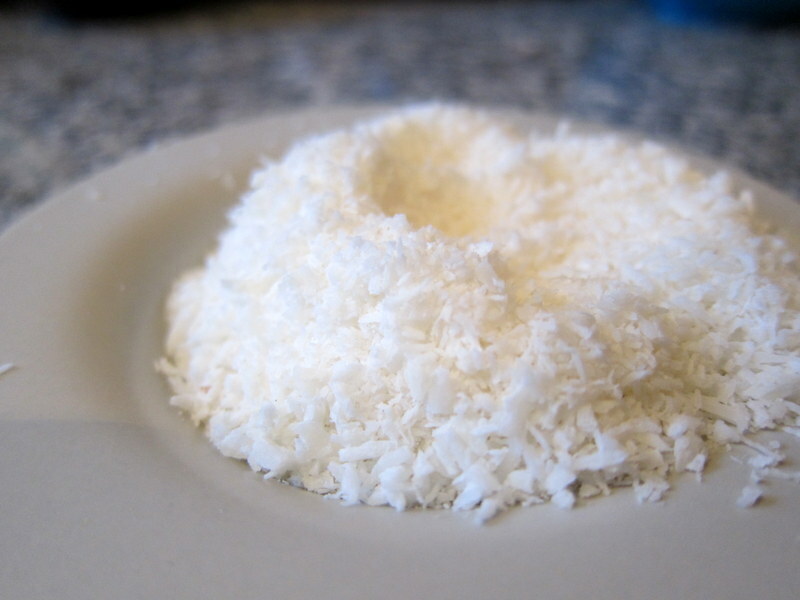 Shredded coconut is one of the two classic add-ons: We will add ours as mix-ins towards the end of the churning, in order to ensure that the shreds do not end up at the bottom. If you like – make sure you save some shreds for a decorative add-on when serving the ice cream! The churning is finished! The coconut shreds have been appropriately distributed, and those eager to try can dig in right away! 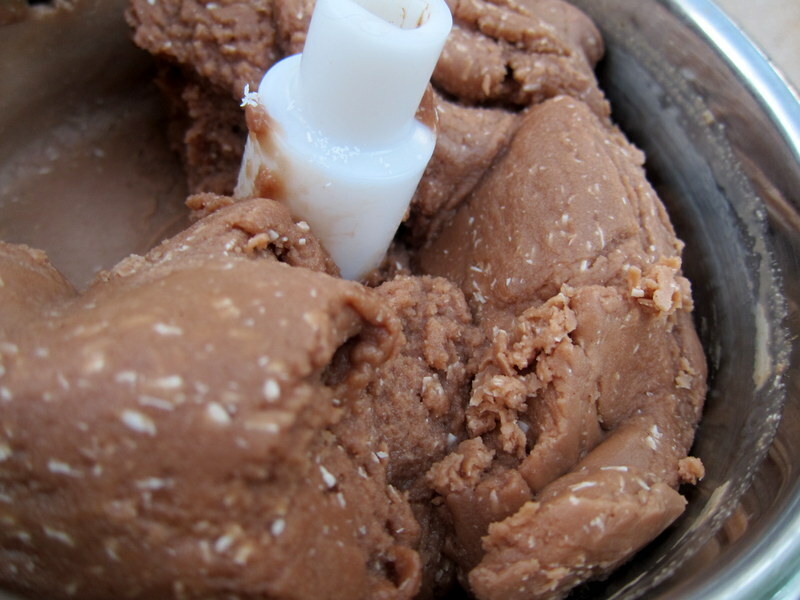 The Chocolate/Oatmeal ball ice cream just after churning. It almost looks like dough, does it not? Is it a really … ? 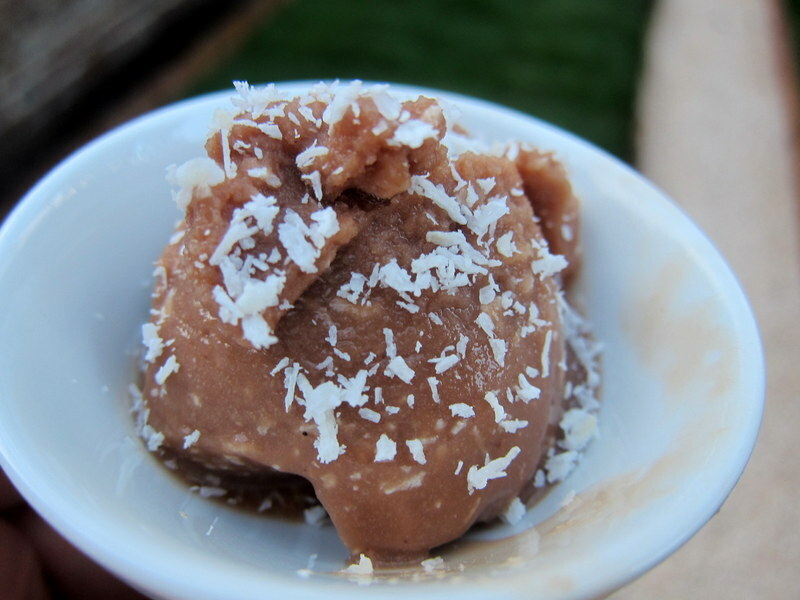 Yes – this is a rounded scoop of the ice cream, with some coconut shreds on top. Quite a look-a-like to the confectionery ball! The Chocolate/Oatmeal ball ice cream really captures a lot of the goodness of the confectionery balls that inspire the recipe. The oat-milk ensures an overall, yet not too obtrusive, base flavour of oat (as it should be! ), in delicious harmony with the contributions of cocoa, sugar and, in my case, coffee. The tasty coconut shreds also work great together with the other flavours, also providing some nice solid contrast in all the softness of the rest. I like this ice cream a lot! 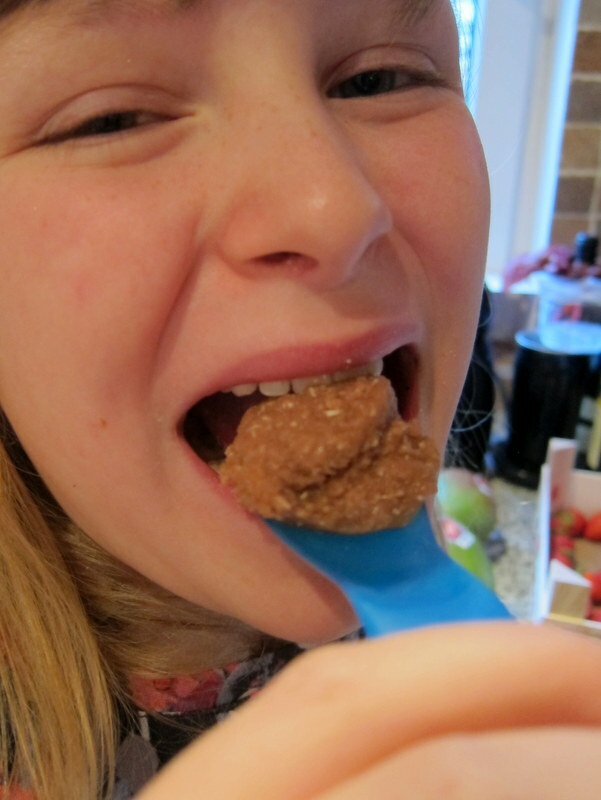 And what about the most discerning tasters of the family? 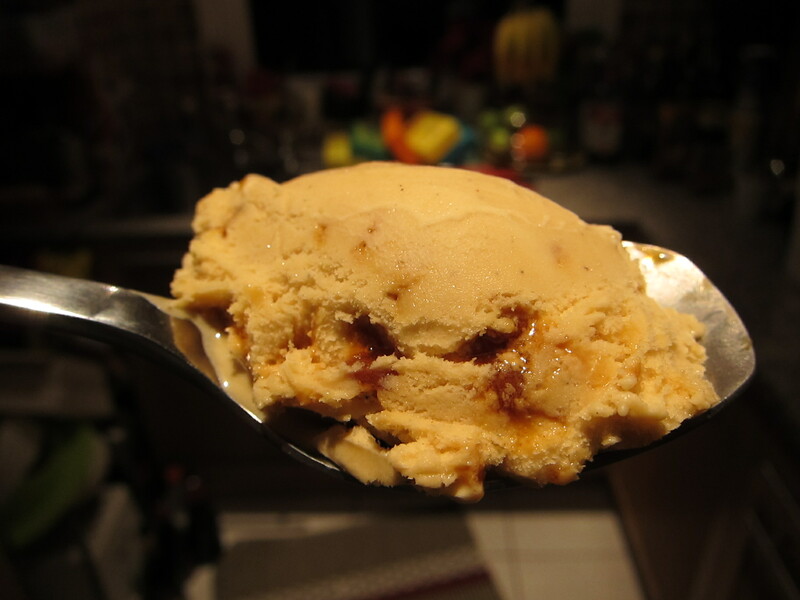 Luckily, I am happy to report that this recipe has become a hit – the kids love the ice cream! The Chocolate ball (also know as The Oatmeal ball) is a type of simple, no-bake Swedish pastry, loved and baked by generations of Swedes.True to the original, this ice cream-version contains neither milk, nor cream and is very easy to make. For a somewhat more "adult" flavour, add a little coffee! 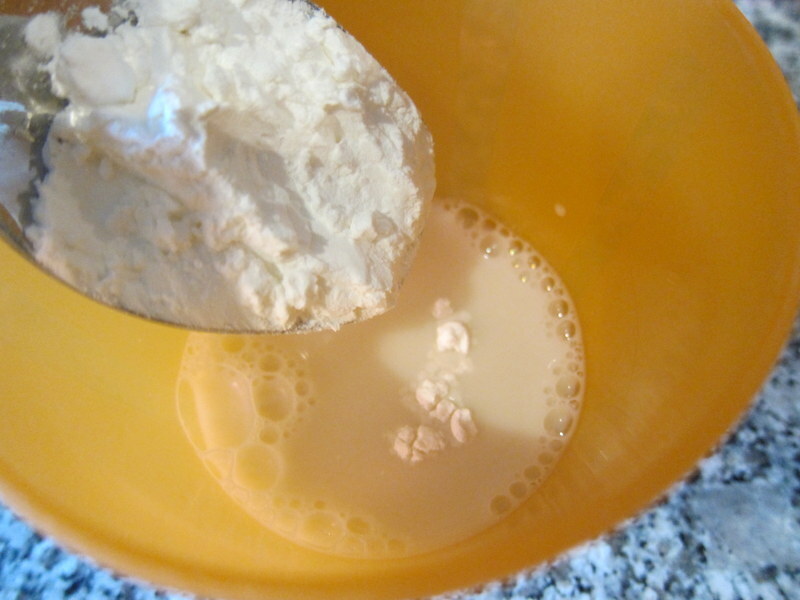 Put aside a little of the oatmilk in a glass and whisk in the corn starch, making sure it dissolves. 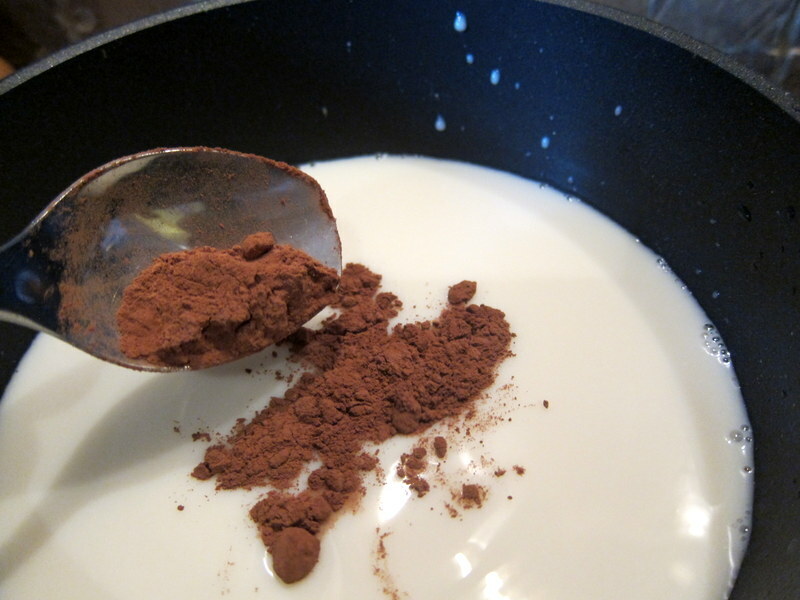 Mix the rest of the oatmilk together with the sugar and the cocoa. Bring to an almost-boil. Add the corn starch-oatmilk mix and whisk well, keeping the temperature hot (about 80°C/176° F) for about five minutes. Towards the end, add (if using) the butter and the instant coffee powder. Take off from the heat and let cool down as quickly as possible. When cool, preferably let chill in the fridge for a couple of hours. 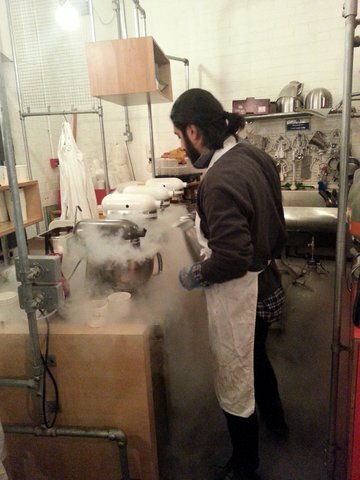 Churn the ice cream in your ice cream machine (or still-freeze using your freezer if you do not have any). Towards the end of the churning, mix in the shredded coconut . Enjoy freshly churned, or store in a freezer-safe container, preferably with a plastic film over the ice cream before the lid is put on. Next story Aquafaba – fast and vegan alternative to Italian meringue!